deracination is a long-lived and nearly universal trope in white American literature… Subconsciously deracination probably has…to do with a desire not to have one’s visual field constantly invaded by inconveniently different faces—relationships that are fraught, unfixed, capable of producing equal measures of helplessness and guilt. But there is also, perhaps almost too easy to ignore, the question of scale—the scale our lives are measured against, the fundamental American desire to stand out on the horizon, alone with our thoughts, to be a figure against the visual field around us. The year is 1967. San Francisco is becoming increasingly multiracial. B. knows “dimly” that she’ll “never go near another city again.” She doesn’t really know why. Race is not something she thinks about explicitly (she doesn’t have to, after all). She just knows that she feels a certain unsettling way in the city, particularly around “dirty young people,” as well as women who expose their legs, women who study science, activists, naked children, and people of color (in one scene, B. thinks the face of a black man on a wanted poster is “eerily African”). She no longer believes, as her mother taught her, that marriage is the answer to her confusions. She doesn’t know where to find an answer. So she tries to push all things confusing into her rear view mirror. On the road B. tours an America dramatically unlike the one Kerouac toured ten years prior in On the Road. B. visits beauty parlours and pretty suburbs and national parks and eats hamburgers from gas stations and occasionally sleeps in motels with an alcoholic custodian, Daughtry, who loves her. Also, she robs banks. Daughtry teaches her how to do it — you forge checks and cash them, basically — and she gets hooked. B. doesn’t rob banks for the money, though; she robs banks for the “cool expansive feeling” it gives her. Robbing banks feels to her a bit like taking Xanax. And because she is confident, and because she is 30 and white and pretty, she doesn’t get caught. One cop even hits on her. (It takes B. a while to notice that his gestures are flirtatious. She’s as alienated from her sexuality as she is from her time and place). What triggers “the carsickness”? Multiracial spaces, feminism, difference, relativism — in a word, postmodernity. Though she herself is not aware of it, not even close, B.’s white flight is a flight from the uncertainties of postmodernity toward the certainties of modernity. “how much of / pilgrimage / is failure / to embrace where you are,” writes Heller Levison in her book Wrack Lariat (reviewed here). B., like many other white members of her zeitgeist, cannot embrace her cultural present, so she tries to pilgrimage back in time. It make sense, then, that B. again and again remembers with painful nostalgia her mother, a figure who embodies a pre-postmodern, fashionably suppressed white American feminine ideal. This is an ideal that B. yearns to recollect and live by, as though it were a state of grace from which she has fallen. B. remembers fondly the day her mother sent her an embroidery kit: “‘There’s an order to things,’ she told B., ‘and I think it would help if you followed it.’” She remembers the day her mother “taught her the proper manner to sit in a skirt.” And so on. These and other similar memories evoke in B. a pleasant sensation not unlike the “cool expansive feeling” she feels when robbing banks. But B. shouldn’t get what she wants. 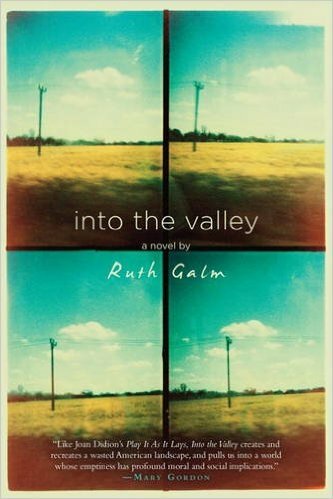 Into the Valley would be stronger if its protagonist’s flight didn’t land successfully (or, to be more precise, somewhat successfully: the novel leaves some questions up in the air). In the novel, after all, B. not only flees the city for a whiter place. She also quits her job, robs banks, vaguely kidnaps a teen, and proposes to Daughtry and then abandons him. 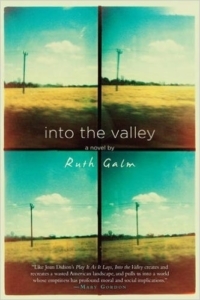 Disregarding the worrisome ideological implications of awarding success to a white character who flees a multiracial city to achieve some fantasy of deracination — “the desire to ‘get away from it all,’” writes Row, — it is, on the level of craft alone, unbelievable that a protagonist could burn so many bridges without setting herself on fire. Actually the most B. suffers in the end is a sunburn, nothing serious. That, and a cut on her foot. B. ends up fine, even better than where she began. Galm’s debut novel could benefit from a dash of authorial cruelty.